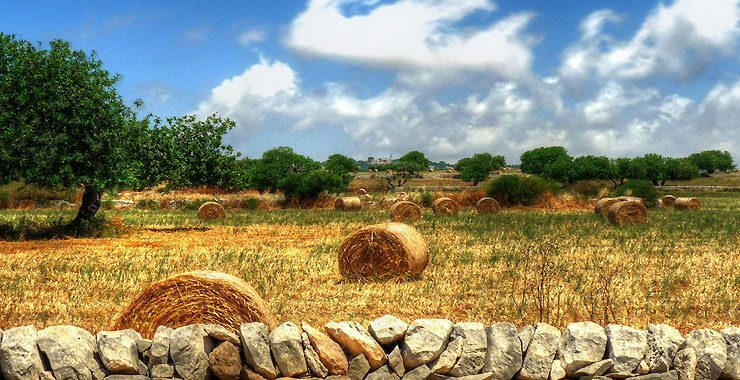 Puglia, the “heel” of Italy’s “boot” is a land of sunshine and hospitality. Boasting over two thousand years of history, its peoples include the ancient Greeks and the Romans, the Byzantines and the Normans, the Swabians and the Angevins. Over the course of this walking holiday, you’ll explore menhirs, cave churches, medieval castles, Baroque and Romanesque churches, noble palaces and historical residences, enchanted hamlets and art cities, charming masserie (“manor farms”) and casali (“rural homes”). The landscape itself is a marvel, with some 800 km (500 miles) of pristine coastline and a hinterland comprising expansive valleys and gentle hills covered with olive trees, vineyards and luxuriant forests — a perfect countryside in which to enjoy full day rambles followed by scrumptious meals brimming with the exceptional flavors of the south. Day one: You arrive in Bari on the coast of Puglia, where your tour rep meets you for a transfer to Trani. You have the rest of the day free to explore this picturesque port town. Day three: Following a transfer, you walk to Matera, capital of the Basilicata region. Explore here the Sassi district, the ancient part of Matera in which caves dug into the surrounding hills once served as houses and churches. Day eight: You depart Puglia from the Ostuni train station. From here, you can easily reach all of Italy, including Florence, Rome and Milan. Or ask us about transfers, for instance to nearby Lecce, the “Florence of the South”. We price this tour for the following categories of accommodation. You can keep your tour private to your own group or you can open your tour for other travelers to join. Single Supplements (sing. supp.) are charged on single occupancy rooms only. All prices are quoted per person in USD.